Providing an insight into the way buildings are used. People rarely ever use buildings quite as the architects had planned. They find corners in which to gather and gossip. They create shortcuts to find the fastest way to the canteen. As people start to adapt to buildings, so the buildings themselves learn to adapt to them. DoppelLab is designed to make that process more open, collaborative, informed and transparent. It is a system that allows people to see inside the inner life of buildings as they use them. Modern buildings are now awash with sensors put there for different reasons, to run lighting systems, to pick up movement, to control heat and for security. Employees also invariably carry with them fobs and security passes with RFID tags. DoppelLab brings together the information gathered by this multitude of sensors to create a complete, 3D visualisation of how a building works. 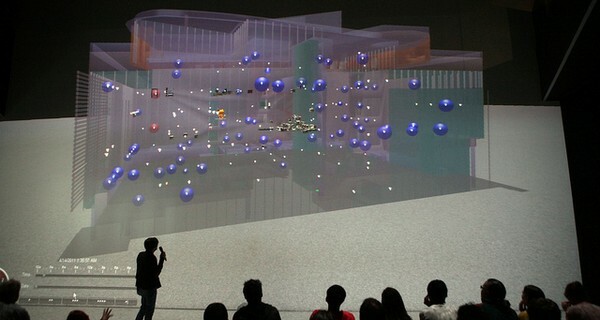 Using a software engine widely used in high-end computer games, the basic data is represented graphically within a 3D simulation of the building. Noise is represented by particles floating around. Movement is an arrow. Heat is shown as flares and plumes. Using these tools it quickly becomes clear which zones of the building are dead and which are busy, and where people congregate to chat or where temperatures vary from the norm. By creating a detailed 3D representation of the social and environmental life of a building, the system, which is still in beta, could allow much more intelligent, thoughtful management of both people and resources.